I’m sad our vacation is over. We had such a wonderful time! All the planning and preparations really helped things go smoothly. I am an avid planner, obviously, and I think it paid off this trip. I think it always pays off, but specifically when you have a shorter trip. We definitely used every possible minute of every day to its fullest! Getting our dining reservations set ahead of time was a great thing. We heard over and over from the Cast Members – “I’m so sorry, we don’t take walk ups – you need to have a reservation”. Why would people go and not make reservations? I dont think people realize the demand for the sit down restaurants at Disney World. I’m shocked at the amount of people who are content to just ‘wing it’.There was a family with little kids that I overheard, they were so sad that they couldn’t eat at Be Our Guest. The mom was almost crying as the cast member was telling her that people make reservations 6 months in advance! I went up to her and told her to get the My Disney Experience app – and to just keep looking. We were able to get a table the morning of. I’m sure people cancel all the time. When you make these reservations 6 months out, chances are that your plans change a little bit and you need to rearrange reservations. I hope that that family was able to get a reservation. We only had sit down reservations a few of the days. We are not big eaters, we would rather snack our way around the parks. But when the boys come with us, we definitely get reservations for most meals. They want to EAT, not stand around and wait for a table. I also was so happy that we made our Fast Pass choices early. We got to ride all the rides we wanted to, sometimes more than once! The Fast Pass lines moved pretty quick on all the rides where we used them. We only ended up skipping one ride where we had a fast pass (it was only because we didnt want to walk so far over to the ride). I was able to grab additional fast passes after we used our initial 3. Using the My Disney Experience app – it’s easy! We did use the single rider lines a couple times, too. I wish every ride had single rider lines. For families with older children, or adults travelling together its a great time saver. You can get onto rides in a fraction of the time that you would if you stood in the standby lines. You still stay together in line, you just dont ride next to each other on the ride. I am glad that we didn’t splurge on the room. We chose a value resort because we knew we would be in the park from open to close and would not use any of the amenities. Pop Century was fine! I had really low expectations, and it exceeded them all. 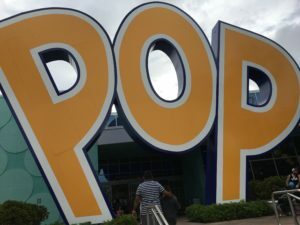 I would definitely recommend Pop Century to friends and I would stay there again! The resort was clean, and cute, everything was in working order, it felt like Disney and we had everything we needed. We could have spent a lot more money, stayed at the Beach Club (still my favorite) and I would have felt like it was a waste. This trip was a low budget trip, and even though we did splurge on a few things, the hotel room was not one of those things. 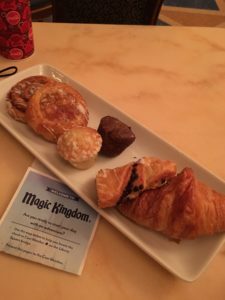 We did splurge and do a Wishes’ Dessert Party – best money I could have spent. We had a comfy, uncrowded spot to see the fireworks! And since this was really the reason we even took this trip, it had to be the focus. I wanted to make sure we had wonderful memories of this last time we would see it. I knew we would watch it one night from the back of the castle, because that’s where my daughter always worked the ‘snow ropes’. 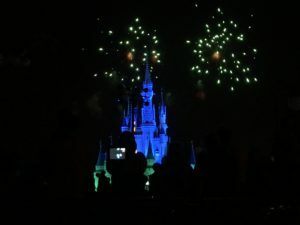 But I also wanted to have a great spot in front of the castle to see the show. For the price, the Dessert party was a great way to not only have some yummy desserts, but also to guarantee a great spot for the show. I loved it and recommend it to anyone who would rather not sit for 3 hours on a hard curb to save a spot. 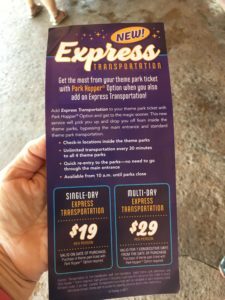 Express Transportation – awesome service! The Express Transportation add-on was incredible. I sure they keep that service. For the money, it was really a great service. We were able to hop from park to park easily and quickly. Yes, it took a little planning in order to be at the bus stop when the buses were arriving, but they come every 30 minutes – on a schedule, so you could just go grab a snack and return for the next one. I loved that it picked us up and dropped us off right in the middle of the park. We got to avoid security and the front of the park masses. It was so convenient and we used it a lot! I don’t know if we could have done 4 parks in one day without it. 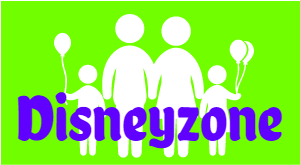 I hope more people start using this service, so its profitable enough for Disney to keep it around, but not so many people that the lines are long and you cant get on the buses. I wish we could go back. It’s just so far.. and even though we did try to save money and make this a low budget trip, it was still a chunk of change. It’s hard to justify going back too soon. Although we didnt get to see the new Avatar land – Pandora, and we didn’t get to see the new nighttime show at Magic Kingdom, or the new Star Wars land at Hollywood Studios – so we definitely have a valid reason to go back.. As of right now, no future trips are planned. Next time I would love for us ALL to go.. Maybe in a few years! I think we better start saving NOW!